Diamonds are associated with prestige and glamor, and a diamond engagement ring is a sought-after prize for spouses-to-be of both genders. As a result, many people believe diamond engagement rings will always be expensive, no matter what. This is reinforced both in media and public perception—our society idolizes huge diamonds such as the Hope Diamond or the Moussaief Red Diamond, which are worth millions. Or the rings that grace celebrity fingers worth hundreds of thousands of dollars. These diamonds are beautiful, but reinforce the idea of diamonds being a massive expense for many couples. 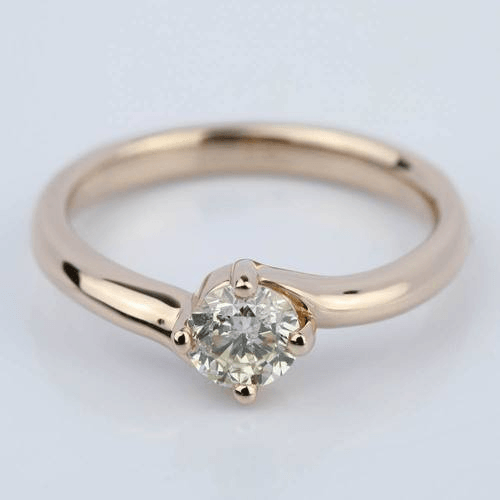 Previously, we wrote about getting an inexpensive ring by opting for a moissanite gemstone over a diamond. But a lot of people asked how they could accomplish the same feat without giving up the real McCoy. The good news is that there are a number of ways to get your love a diamond engagement ring that is both real and economical. Inexpensive diamonds can be found all over, if you know where to look and what to look for. 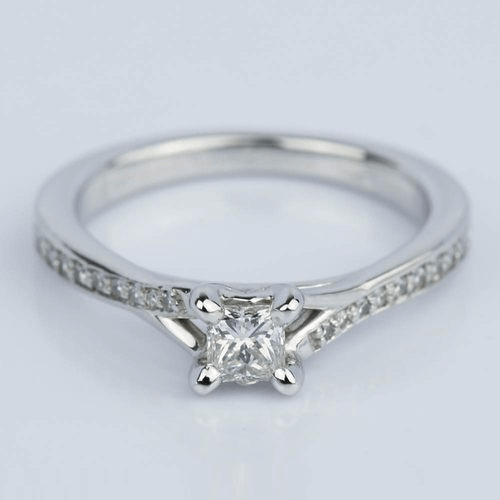 Here is a quick guide on how to find inexpensive, genuine diamond engagement rings. Using these steps, you could easily find the perfect ring for under $1,000. One of the biggest influences on the price of a diamond is its size. Diamonds are weighed in carats, and the larger the carat weight, the more expensive it will be. To save money on your diamond engagement ring, you’ll want to go with a lower carat weight. Loose diamonds under half a carat can be found for as low as $200. Round cut diamonds are the most common cut, so you’re more likely to find more options to fit your budget, but it’s a little-known fact that the round brilliant is also the most expensive cut, so don’t be afraid to look at non-traditional shapes. The added bonus of fancy-shaped (shapes other than round brilliant) diamonds is that many are elongated, like the marquise, oval, pear, and emerald, which can help a modest diamond look much larger. The best way to get a bigger diamond for your engagement ring is to lower the grade on one of the other major price influences—the cut, clarity, and/or color. A diamond with low quality cut will be less brilliant and less expensive, and generally, we avoid suggesting to cut corners on this aspect as the brilliance and fire are what make a diamond special. So let’s look at the clarity and color. With clarity, it’s possible to obscure poor clarity with the faceting in the diamond. Shapes that benefit from this are those that are brilliant cut, meaning they have maximum faceting. Round, pear, marquise, oval, princess, heart, radiant, and some cushions are your top choices. But if you drop too low with the clarity grade, imperfections will still most likely be visible to the naked eye. The larger the diamond, the larger the facets, and the less they are able to hide the inclusions. With color, a lower grade diamond will appear more yellow or brown, but this can be easily mitigated if you set the diamond in a warmer yellow or rose gold band. 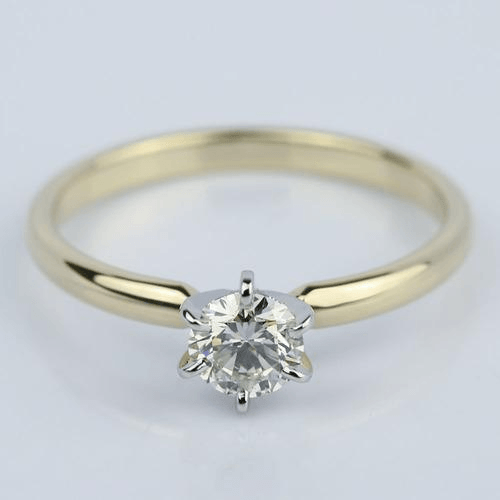 Even a diamond with a high, “clear” color grade would reflect some yellow light from the band, which means you can go for a lower grade for a large price difference without much difference in appearance. If your partner likes vintage style, this is a great option, as the metal color and lower color stone will have a definite antique look. 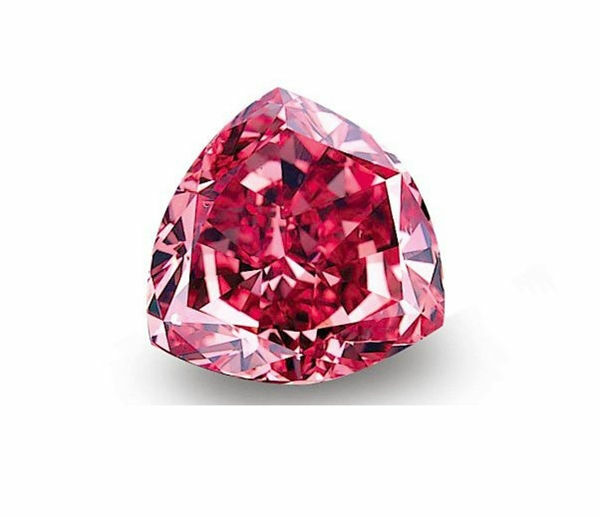 Some shapes also disperse color better, including round, pear, marquise, and heart cut diamonds. Other shapes enhance the natural color of the stone, so if you’re trying to use this trick, avoid shapes like emerald, radiant, and cushion. Most people don’t realize how much of the cost of the engagement ring is influenced by the band and setting. A simple band in a 14k gold is going to be a great deal less expensive than a halo setting in platinum. That’s not to say you shouldn’t have any detail for your engagement ring. 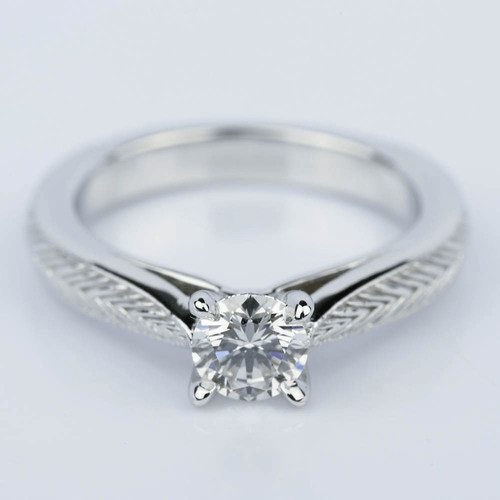 Engravings or a unique metal finish can give a budget-friendly ring an expensive look and feel, or even a personal touch that will impress your partner, no matter the size of the diamond. 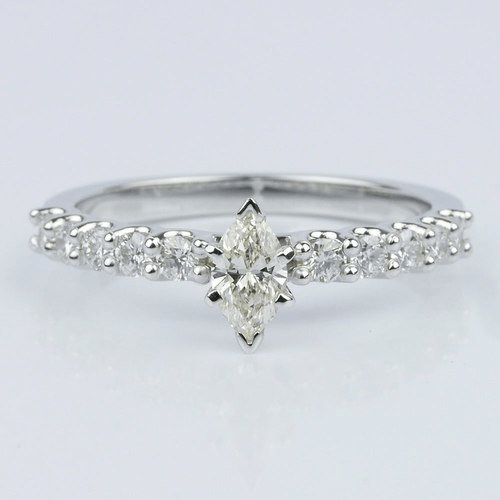 For example, a ring with simple milgrain beading or geometric designs is perfect for a woman who loves vintage fashion. Some cultures also developed distinctive jewelry styles such as Celtic knots or Greek labyrinths; these can celebrate the culture of the bride’s heritage. You can also up the bling-factor of a small center stone with diamond side stones or diamonds in the band (like the micropave setting pictured above). As long as the total carat weight in the ring remains low, you can still get an engagement ring encrusted with real diamonds for an affordable price. 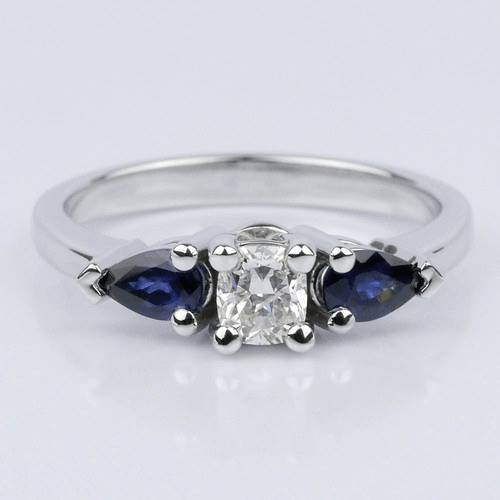 To further cut costs while still getting a ring with side stones, go for gemstone accents, not diamonds. There are a number of gemstones that can accentuate your diamond that are less expensive, and even resemble their rarer cousins. Tourmaline or garnet can stand in for their transparent and rarer cousins sapphire and ruby. Opaque stones, such as hematite, onyx or lapis lazuli, can also provide and elegant but inexpensive accent. Buying diamonds doesn’t have to be daunting or require your entire life’s savings. In this day and age, you really don’t even need to spend the traditional three months’ salary to get the perfect ring. You can get a diamond engagement ring that is cheap, but real! Follow these guidelines to the engagement ring of your beloved’s dreams!